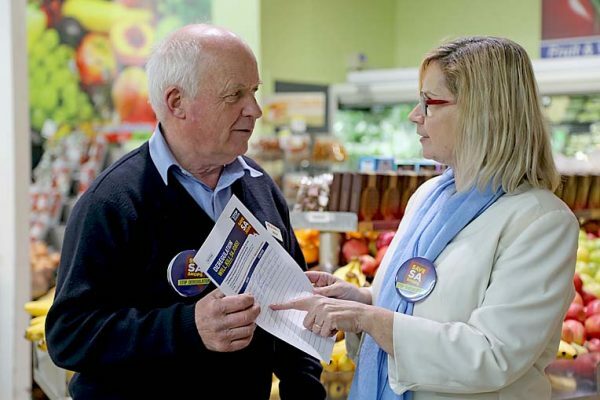 STATUS QUO SUPPORT: Foster’s Foodland manager Brian Foster highlights the implications of abolishing Millicent’s unique proclaimed shopping district status with Labor MLC Clare Scriven. THE State Labor Party is ramping up opposition to the Liberals’ proposed shop trading hour changes in Millicent, with shadow frontbenchers Clare Scriven and Kyam Maher backing a petition against the move to deregulate. The petition, released as part of the Stop Deregulation Campaign, urges individuals to sign to “keep the balance that supports SA businesses and local jobs”.